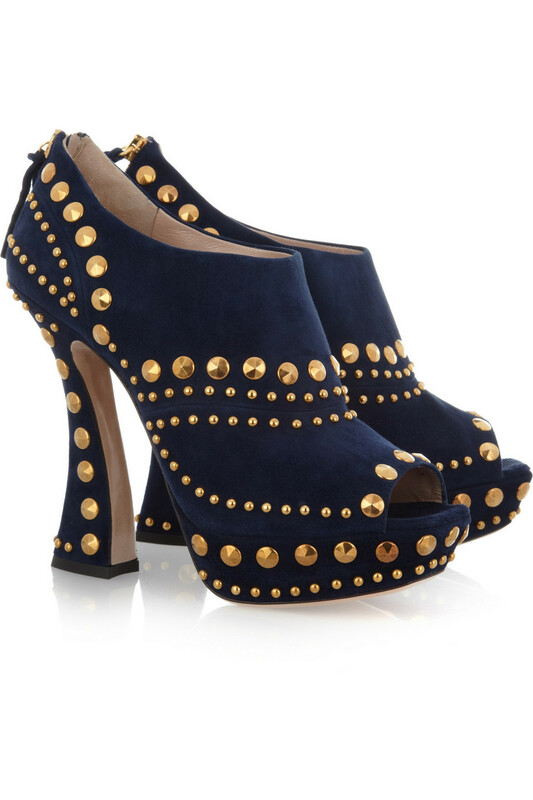 Today's So Shoe Me is the Studded Suede Ankle Boots by Miu Miu, $975, available at Net-a-Porter. Step out in studs and suede with this statement making bootie by Miu Miu. Neutral in navy, but bold in gold these richly studded shoes will keep up with the overly ornate trend but still have the basic bones to work with everyday separates. Precisely placed studs and a unique curved heel add interest with a high end touch making this the perfect heel for work or play. The rich shades of navy and gold are perfect for fall and will pair well with the quintessential concentrated jewel tones and modern metallics. Pair these studded boots with a high-end high-waisted leather pencil skirt and a metallic brocade jacket for a dreamy and decadent style. So Shoe Me a pair of super studded ankle boots in a rich navy suede that will add an on trend decadence to my favorite fall separates.